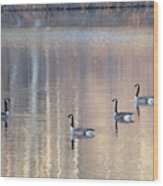 2003-geese by Martha Abell - 8.000" x 6.000"
2003-geese framed print by Martha Abell. Bring your print to life with hundreds of different frame and mat combinations. Our framed prints are assembled, packaged, and shipped by our expert framing staff and delivered "ready to hang" with pre-attached hanging wire, mounting hooks, and nails. 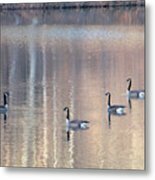 There are no comments for 2003-geese. Click here to post the first comment. 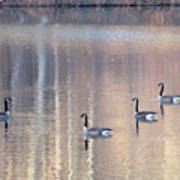 Four Canadian geese on a lake in Kernersville, North Carolina, are part of a gaggle of approximately 15. The reflections of the trees and the rising sun in the lake add to the ambiance.